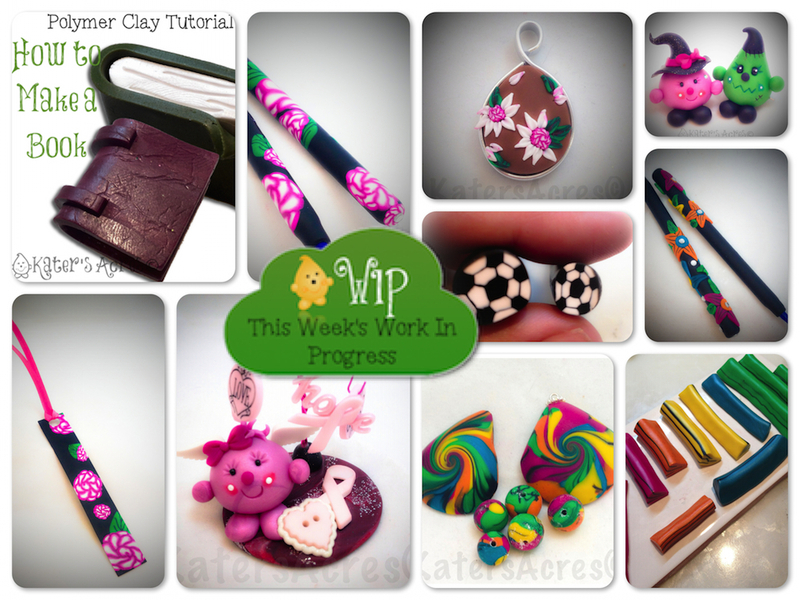 In last week’s edition of WIP Wednesday you may have seen a picture of The Polymer Arts magazine that arrived in my mailbox. I thoroughly enjoyed this issue & especially the reminder to “play.” That being said, after I got my orders done this past week (and started on some others) I decided I needed a little play time too. So this week I did a lot of things, and many of them just for me! Several weeks ago, one of you, my darling readers, asked for a tutorial on how I make my mini-books. I’m not sure how others do it, but this is how I do it. I have made them this way for over 6 years and have no idea who to give credit to for the idea, my apologies. See the tutorial here. One of my “play times” centered around making myself some new polymer clay pens. I made 4 of them for myself this week. Two rose & leaf caned pens using some of the canes from the 52 Weeks of Canes projects. I got a new kind of wire, it’s a flat wire that I wanted to use to make my own bails & casings for my embroidered pendants. So I played around with it. It will definitely take some tweaking, but my first one didn’t turn out too bad. Parker & Lolly are getting ready for Halloween. I made a limited edition set of Parker Frankenstein & Lolly Witch figurines. You can adopt them here. More polymer clay pens. I made these using very simple flower petal canes in bold colors with black stamens. I placed them all over the pens. Gorgeous I tell you! And of course … leave no scrap behind! Here’s the pendants & beads I made with the scraps of all those canes! My cousin has been recently diagnosed with Breast Cancer. To help her in her understanding, peace, & battle I made this Breast Cancer edition Lolly with wings, pink hearts, slogans (family, love, courage, hope), and of course a pink ribbon. And from the scraps of the pens I made, I made a bookmark too. The next card I send to my cousin (she’s an avid reader) will have this pink & black bookmark in it. This past week I was really blessed to have several people send me their photos of work they had completed using my tutorials. Check out these wonderfully creative projects (links to their respective tutorials included). “Frank E. Stein” by Sasha Crowley – Made using Frankenstein Tutorial – Notice how Sasha made Frank her own by doing his hair & facial features differently. Dragon by Pamela Hynes – Made using Dragon Tutorial – Pamela made a fantastic dragon and rather than giving him wings as the tutorial suggests, she gave him scales. Great work! “Frankensnail” by Jo-Ann Wenck – Made using Frankenstein, Pumpkin, & Snail Tutorials – This is 100% original and fun. Combing parts & pieces of all 3 tutorials, Jo-Ann made a one of a kind item that you will only find from her! Remember that when you buy a tutorial you a purchasing inspiration. Unless it’s technique driven, any sculpting tutorial can be adapted to your own style and should match your personality. All of the artists shown here today did just that. Two of these fantastic artists are part of Parker’s Clayful Tutorials Club and are just learning to sculpt. Congrats! I’m proud of each of you! My weekly inspiration this week is none other than Carolyn & Dave Good ( of 2GoodClaymates). While this item is NOT new, this week it’s been toying me. Therefore I made similar canes with bold colors and black accents. Aren’t these just gorgeous? Visit their blog to see more (and get free tutorials too).